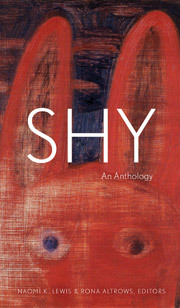 I just received a copy of Shy: An Anthology, published by The University of Alberta Press. It’s a beautiful book — I love the cover — and one of my poems happens to be inside. It’s a very personal confession called “Women Friends” that I was too shy to publish for over 25 years! It’s good to see it finally find a print home. There’s good stuff in here: poems by Don McKay, Steven Heighton, Lorna Crozier, Wayman Chan, Bruce Meyer, and others. Prose by Aritha Van Herk, Sydney Sharpe, Russel Wangersky, et al. The Montreal launch will be taking place on Nov. 11 at 7pm, at The Depanneur Cafe, 208 rue Bernard Ouest. I’ll be reading selections of the anthology along with fellow Montreal contributors Jeff Miller and Eve Krakow. This entry was posted on Friday, October 11th, 2013 at 9:52 am	and posted in Books, Events, Poetry, What's new?. You can follow any responses to this entry through the RSS 2.0 feed.